Discover several ways that that electricity can be produced for free. Find out how we can claim that "perpetual motion" is possible, even without violating any of the laws of physics! Exhibits of what has already been demonstrated and proven in "The Case for Free Electricity. See our Hummingbird Motor producing 5 times more torque relative to the electricity supplied. See demonstrations of several other ways electricity could be produced for free, such as with the neutrino technology. Take our Technology Tour and learn about revolutionary technologies available now and about the really exciting ones which await. You'll also receive several indirectly related eye-opening DVD's, including one by Aaron Russo titled America Freedom to Fascism, and several others - all of which may collectively help you to Thrive! See Magneto Hydro Dynamics at room temperature. Nega-watt circuit demonstrates electricity is used but not consumed. Medical laser camera to see right through the human body. See skeleton and organs without any harmful radiation. Burn garbage without smoke or noxious oxides. Renowned Dr. of Electrical Engineering Various engineers, machinists, etc. Expert on Tesla's research from 30 years of study. The following are available NOW! Power Controllers - save 1/3 to 1/2 the electricity to power motors. Flame Retardants - non-toxic and more effective than conventional. Therm-A-Guard flame retardant paint that can significantly reduce heating and cooling bills. Fire Sentry puts out a stove fire even if you're away and forget to turn off your stove. Soni-Grow makes everything that grows - grow better. 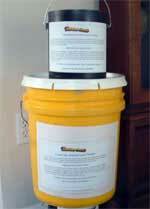 Insect-a-Shield kills insects without poison, environmentally safe and completely non-toxic.